I am so sick of reading about the ridiculousness that is in the world these days and find myself wondering why people don’t just DO THE RIGHT THING. I think about this a lot differently after becoming a parent. I find myself in the odd position of trying constantly to explain to my children why adults say one thing and do another. This includes myself; until I started being more conscious about just what my role as mother and our role as a family are playing in my children’s life. As a parent, I learned that sometimes doing the right thing hurts, but someone has to do it. There become moments in our life when we need to make decisions that go against what we would normally do. This was especially true for me after becoming a parent. What also changed after I became a parent is my intolerance for injustice regarding children. I am NOW a firm believer that ALL LIFE MATTERS AND ALL LIFE IS CREATED EQUAL. I’m not sure if you are informed about the issue regarding Invisible Children and the War regarding KONY2012. This is a story that brings me to my knees. I can’t imagine what these women and children have been through. I mean, I am having a hard enough time in the USA battling the idea of No Child Left Behind. However, the spotlight on children all around the world is something that we as parents need to pay attention to. The movie MOVE reintroducing the idea of KONY2012 highlights the concept of the “ME” generation. And although, I do believe there is a truth to this – I think it is only a half truth. This would be separating the responsibility of the youngest generation from that of the “older” ones. The older ones definitely have neglected theirs. Maybe as adults what we forget is that a child is more resourceful than we imagine, and they grow best when protected by a sense of security. The world in NOT a secure place. “Children” (we are all children in God’s eyes) can not live in a world of exceptions, contradictions, and inconsistencies without being morally damaged. We all grew up this way – We’ll use society as a whole as our “sample” for evidence. So, in order to help my children navigate this world I had to learn that I need to ask my children to do what is right because it is right, not not because there is a penalty for doing what is wrong. Just Do It! Be in it – not of it. Most children do not have fears, hatreds, prejudices or intolerances – these they must acquire. Most children are by nature friendly, with little consideration for controversial subjects or petty antagonisms. They are too interested in the world around them to pass negative judgment unless they have been conditioned to do so. My job is so much harder than I thought it was. Doing what is deemed right is a natural feeling to children. It comes with the territory of how God made is. We already know that peace and harmony exists among other objects in nature. Life can sustain itself. Reshaping the truth to protect or promote yourself; building a business by stepping on others and trying to see just how much you can make off someone; lying to get yourself in front because you’re too impatient to do it the right way…this needs to stop. It’s time to do the right thing. In life and in business, there really shouldn’t be any other way. All human beings, by their very nature like good things and dislike bad things. For instance, everyone of us approves and likes truthfulness and hates falsehood. Even a liar does not like to be called a liar. So, in general we can say that human nature likes the Right and dislikes the Wrong. Human nature also loves peace and hates disorder. It is meaningless to argue that human being act without freedom and that we are forced to act the way we do. We decide for ourselves what we will do, and what we will not, and we are responsible for our own actions. 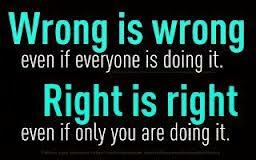 Wrong is wrong, even if everyone is doing it. 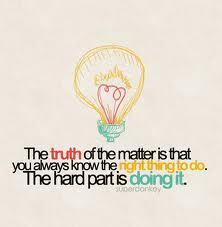 Right is right even if only you are doing it. This entry was posted in Uncategorized and tagged africa, becoming a parent, children, consciousness, current-events, dark spiral, Do the Right Thing, happiness, healing, human, humanity, invisible children, just do it, KONY2012, learn, life, live, love, mom, motherhood, nike, No Child Left Behind, odd position, one love, oprah, Oprah.com, OWN.tv, Politics, society, Sports, universal, world, www youtube, youtube.com. Bookmark the permalink.